If you love to cook or just love to collect cookbooks, start making space on your bookshelf now because there’s a new cookbook in town. 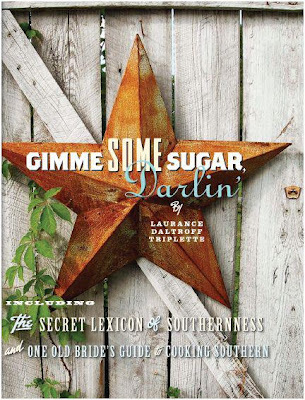 This delightful compendium of all things culinary, Gimme Some Sugar, Darlin’ by Mississippian Laurance Daltroff Triplette, is true piece of southern Americana, as much about the culture of the south as it is about the cuisine. Gimme Some Sugar, Darlin’ , which was awarded a silver Benjamin Franklin Award for editorial and design excellence by the Independent Book Publishers Association, is not only an extensive collection of superb southern recipes, it is also an encyclopedia of all things southern from frog gigging to football. The first forty pages of this two-color retro-formatted 384 page cookbook is a Secret Lexicon of Southernness, a combination of glossary and creative and informative essays ranging from why football is a religion in the south to politics. Rarely does a cookbook exhibit such creative flair along with such delectable fare. This intriguing cookbook is chock full of over 700 scrumptious recipes plus 25 pages of technical advice and tips that were once taught in home economics classes. The basic how to’s cover such topics as canning, roasting, removing stains, table etiquette, vintage housekeeping “receipts,” and even a conversion chart. The recipes in Gimme Some Sugar are not simply down home southern, they are nouvelle southern, gourmet, and cross-cultural. In addition to Tex-Mex and Cajun, there are exotic recipes for shrimp, crab, and lobster dishes plus a number of traditional Jewish dishes such as challah bread and chicken liver pate. For those cooks who entertain often or who harbor a sweet tooth, there are two separate sections of recipes for sweets. There are 30 pages of pies and desserts in addition to 48 pages of cookies, cakes, and candy. Catfish, a southern standby, appears in its usual form, southern fried, as well as in other guises. Numerous fish recipes abound including various types of shell fish and seafood such as pompano and fresh salmon. No southern cookbook would be complete without a recipe for low country shrimp and grits, jambalaya, numerous mouth watering crab and oysters dishes, and that savior of all southern cooks, the omnipresent casserole. Naturally, you can find all manner of meat recipes from pork and lamb, beef and chicken (there is a top notch recipe for southern fried chicken) or turkey to wild game. Not to miss are the scores of delicious vegetable recipes, among them those ubiquitous staples of the southern table: okra, turnip greens, and collard greens. A few of my favorite recipes included in this foray into all things southern are lobster bisque, oyster casserole, grilled duck breasts, frog legs, and tomato pie. I am drooling as I type. 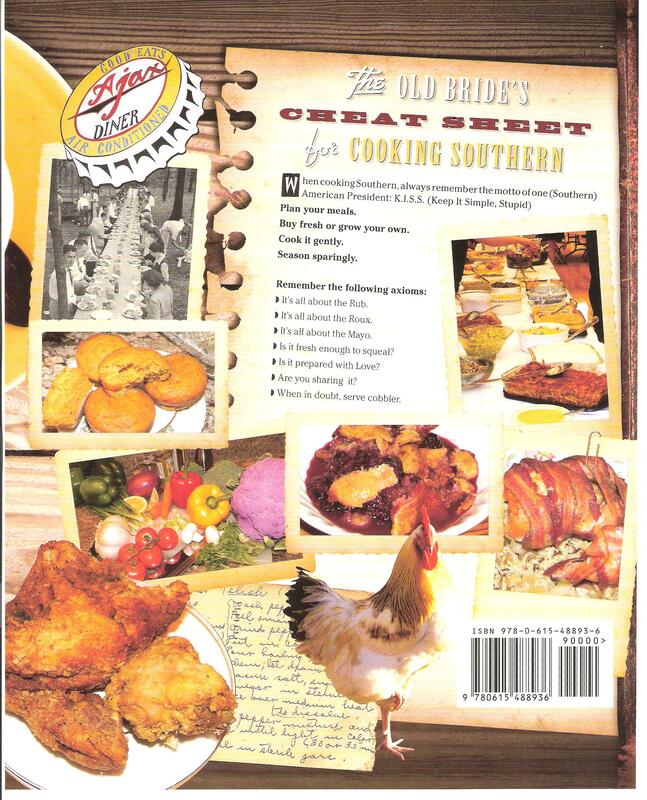 One would be hard-pressed to find a favorite southern recipe missing from this collection. With its wrap around hard cover and spiral wire binding, Gimme Some Sugar, Darlin’ is as user friendly as it is unique and attractive. This handsome and handy cookbook could easily replace several other cookbooks on any food lover’s bookshelf. Gimme Some Sugar is the perfect present for anyone who is southern or simply wants to know more about the south. It is also a excellent choice for a wedding gift. No new bride should be without this cookbook. Gimme Some Sugar is a must have for all your southern friends, a practical as well as a fascinating gift for any non-southern friends, and an entertaining read for anyone on your Christmas list. Your friends will thank you each time they ask themselves “what’s for supper?” They need only turn to any recipe inGimme Some Sugar in order to create a simple weekday supper or a sumptuous dinner to amaze their guests. To purchase Gimme Some Sugar, Darlin’ for yourself or your friends, simply go to the website www.tripleheartpress.com to place your order. You can also email an inquiry to info@tripleheartpress.com or lauriedt@tripleheartpress.com. If you buy now for Christmas, you will get a cookbook bookmark and a 4-color brochure insert containing sample menu pairings and color food pix. Also if you buy 2 or more books between now and Christmas week, you will receive your books by priority mail at no extra charge! Be sure to place your order today. Meanwhile, you can check out Triplette’s new food/recipe column in the new local online magazine, www.hottytoddy.com.